By Scott Gilfoid: Former heavyweight champion Tyson Fury says he has no interest in fighting former WBC cruiserweight champion Tony Bellew (30-2-1, 20 KOs), because he’s a family man and he doesn’t want to hurt him. Bellew, 34, named Fury as one of the fighters that he wants to face next after his 5th round knockout win over David Haye last Saturday night at the O2 Arena in London, England. Bellew said he wants to fight a “mega-star” next, and he then named Fury, Andre Ward, Oleksander Usyk and Murat Gassiev as the top four fighters that he wants to pick from. The names missing from that list are top heavyweights Dillian Whyte, Alexander Povetkin, Jarrell Miller, Dominic Breazeale and Luis Ortiz. Those are all top 5 heavyweights. Also missing from the list are top cruiserweights Mairis Briedis and Yunier Dorticos. “I don’t want to fight Tony Bellew. The reason being, he’s a family man and he’s got a wife and kids. And I want him to stay healthy, stay boxing, and earn a few quid and go home easy to his family,” Fury said to Fighthype. Bellew is too small to be in the ring with any of the giant heavyweights. It doesn’t matter that Fury isn’t a huge puncher. Bellew is a fat cruiserweight, who doesn’t belong in the ring with a large heavyweight of any class. It wouldn’t even take Fury to beat Bellew. Stick him in with some low level contender with size like Mariusz Wach, Alexander Ustinov, Charles Martin, Zhilei Zhang and Johann Duhaupas. The results would be just as bad for Bellew with him getting knocked out. 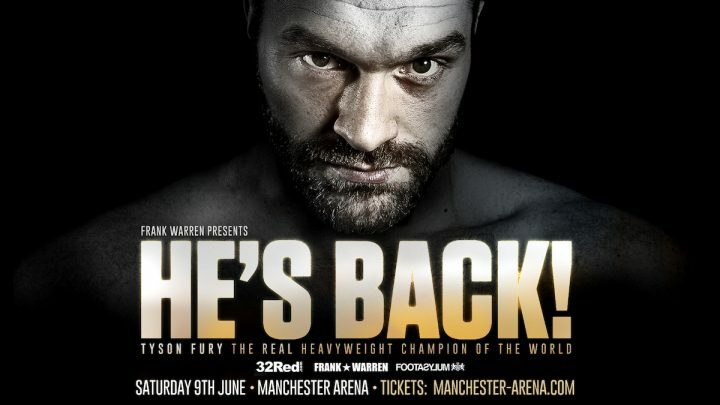 Fury (25-0, 18 KOs) still doesn’t have an opponent for his scheduled June 9 comeback fight at the Manchester Arena in Manchester. Fury’s fight is now less than one month away, and he still doesn’t have an opponent picked out. It’s obviously going to be a low level opponent given that he’s been out of the ring for over 2 years since his last fight against former heavyweight champion Wladimir Klitschko in November 2015. Before Fury starts ruling out a fight against Bellew, you’d like for him an opponent for his June 9th fight. Still, I don’t know who in their right mind would want to see the 6’9” Fury beat up the much smaller 6’2” Bellew for 12 rounds. That’s such a bad fight, especially when you take into account that Bellew still hasn’t beaten a good young heavyweight without injuries. Bellew’s two wins over David Haye came against a fighter long in the tooth and dealing with injuries. “If he steps in the ring with the Gypsy King and I unleash hellfire on him,” Fury said of Bellew. ”He’s only a small man and I could damage him, hurt him properly. You ain’t messing with a David Haye who’s 20 years out of date, You’re messing with someone who’s 6’9”, 19 stone, in the prime of me life, who could knock a wall down. One of the hardest punchers in heavyweight boxing but they don’t know it,” Fury said. Fury sounds like he’s describing another heavyweight when he brags about his punching ability. He’s not a puncher by any means. He’s got two feather-dusters, and the only guys he knocks out are the dreadfully over-matched opponents. Fury has always been a slapper. I hate to say it, but he can punch hi way through a wet paper bag. To be sure, he has a lot of knockouts, but we’re talking about stoppage wins over these low level guys: Joey Abell, Vinny Maddalone, Christian Hammer, Martin Rogan, Nevan Pajkic, Nicolai Firtha, John McDermott, Marcelo Luiz Nascimento, Aleksandrs Selezens, Matthew Ellis, Scott Belshaw, Marcel Zeller, Bela Gyongyosi, Lee Swaby and Daniil Peretyatko. Most of those aren’t fighting any longer, even though their fights with Fury weren’t that long ago. “I don’t want to fight Tony Bellew,” Fury continued. ”Tony Bellew is a light heavyweight/cruiserweight at best, so if I go in there and hurt him then what good is that? How does that make me feel, you know, when he shouldn’t even be in the ring anyway? Listen, we all need money but he doesn’t need money that bad, that he’s going to lose his senses and get smashed to bits,” Fury said. I think the real reason Fury doesn’t fancy the fight with Bellew is because there’s nothing to gain from fighting him. With Bellew being a plumped up cruiserweight, Fury won’t gain anything by beating him. It’s the classic definition of a non-win situation for Fury. If he knocks Bellew cold in the 1st round, the boxing fans are going to call him a bully for picking out a fat cruiserweight to fight instead of a good heavyweight contender. If Fury struggles to beat Bellew, then he’s going to be the laughing stock of boxing. And if he loses to Bellew, it’s game over. Fury would have to retire because there would be no way he could continue on after a loss to a low level guy like him at heavyweight. Unfortunately, Bellew seems to be only interested in money fights, and not about competing against the best in actual sporting fights. Bellew stopped focused on the actual sport of boxing when chose to defend his WBC cruiserweight title against cellar dweller #14 WBC BJ Flores in October 2016 rather than #1 WBC Mairis Briedis after winning the vacant WBC cruiserweight title in May 2016 with a 3rd round knockout victory over Illunga Makabu. When you win a vacant title, you’re supposed to face the mandatory challenger in your first fight. Bellew did things the opposite way by fighting the near bottom rated Flores, and the World Boxing Council didn’t block him from doing this. They could have insisted that Bellew face Briedis. Of course, if the WBC had ordered Bellew to fight Briedis, he probably would have vacated his WBC cruiserweight title straight away. “I can let Tony Bellew hit me and he wouldn’t hurt me,” Fury said. ”Klitschko detonated right hand after right hand on that jaw there and he never wobbled me once. Saw what he done to Joshua with the same punch? So Tony, poor ole’ Tony, be like a feather duster,” Fury said. I don’t remember Wladimir Klitschko landing any big right hands on the chin of Fury in their fight in 2015. I do remember Wladimir following Fury around the ring with his right hand cocked, but without him throwing the shot. Had Wladimir committed to his power shots, he probably would have knocked Fury to oblivion, but he looked too scared to throw any punches in the fight. That’s why Wladimir lost the fight. He didn’t want to throw punches.